Once again, dodgy VCD quality and no subtitles mean that I have probably made up a lot of the story. But it is the characters (and actors) who made Subhalekha so enjoyable for me, not just the plot. It’s a K. Viswanath film, so there is a message. In this case it is dowry, shown in this film as an outdated and bad practice. This is illustrated through montages of newspaper stories as well as incidents in the story. He targets men in particular castes and professions and their demands for a high price, particularly when they have no financial need. But he doesn’t go completely filmi and say love is all you need. Arranged marriage is not the issue – it’s the financial pressure of high dowry demands that can cause massive debt and stress on families. The relationships in the film develop in a believable way (well, most of them), and it seems that the marriages based on mutual respect and affection will probably work out. There is also some very nice character based humour to enliven the story, and I really enjoyed it. 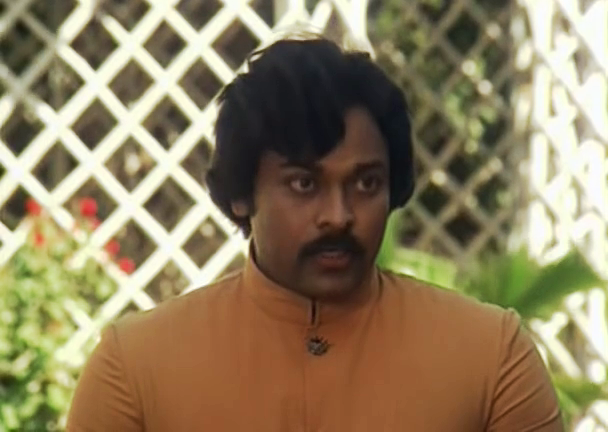 Murthi (Chiranjeevi) is a waiter at a big hotel. He is naturally helpful and generous but not a push over. Unless the one menacing him is a dog. I’ve noticed something in a few Telugu films now – the overdubbing of animals by what is clearly a guy in a studio saying ‘Raaargh’. But don’t take my word for it. 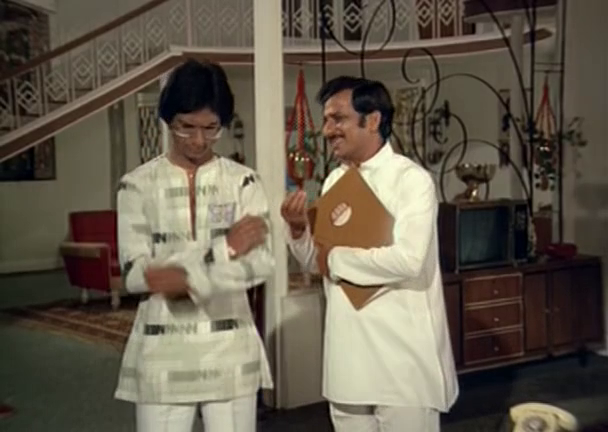 Chiru dances his way to safety, catching the eye of Rao (Arun), an industrialist staying at the hotel. 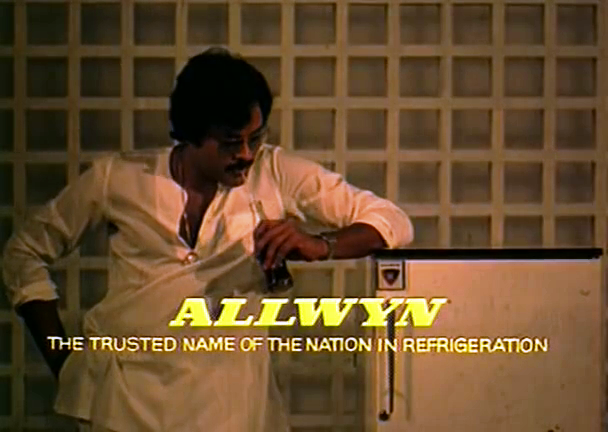 As a result, Rao casts Murthi as the hero of an advert for Allwyn fridges. This clip shows Chiru’s experiments in various classical dance styles, and is that ad within the film. I like the exuberance, the vague attempt at accuracy and the expression on Chiru’s face throughout. I just love watching him dance. I laughed a lot in one scene when a lady in the bank started babbling over the ‘lovely, beautiful, wonderful’ Allwyn Hero when he came in to cash a cheque. That would be me! And I’d totally buy that fridge. Murthi exudes music and energy, singing his way through the day and even using song as conversation. He seems to be reasonably educated and working as a waiter was probably not his dream, but he does it well and picks up on opportunities. He deals with family problems, negotiates corrupt officialdom and is an everyman. Chiranjeevi gives Murthi a genial and easy going charm, with glimpses of the pride and self confidence that keep him going. That earnest vulnerability is worlds away from the mass hero style, and so endearing. Also in the bank and checking Murthi out is Sujatha (Sumalatha). She is a serious young lady, a college lecturer, not a glossy glam heroine. She is due to be married to Mohan (Girish). The wedding negotiations stall over dowry. Her intended is from a rich family and has no need of money. Her father is forced to agree to the price, but Sujatha delivers a dressing down to prospective father-in-law Adisseshaya (Kaikala Satyanarayana) and the marriage is off. I really liked Sumalatha in Khaidi and she is impressive in this role too. While being primped for her meeting with Mohan she brushes off her sister saying she wants to be what she is. Sujatha is resourceful, copes with setbacks and sometimes needs help, and is never a doormat. She and Chiranjeevi make a good couple, and I really liked their little disagreements and playful scenes. Sujatha is sacked from her job and her parents throw her out when they decide she is having an affair with Murthi. Murthi is delighted she stood up for herself against the politician who refused to help his family. So he helps her find accommodation and they live in an idyllic version of poverty, with him acting as Sujatha’s household help. After insulting Adisseshaya, Murthi also loses his job, copping a beating along the way. Murthi uses his connections with Rao to get them both jobs – they never just give up. He might look after Sujatha, but she is an independent woman with her own earnings and a sense of worth. 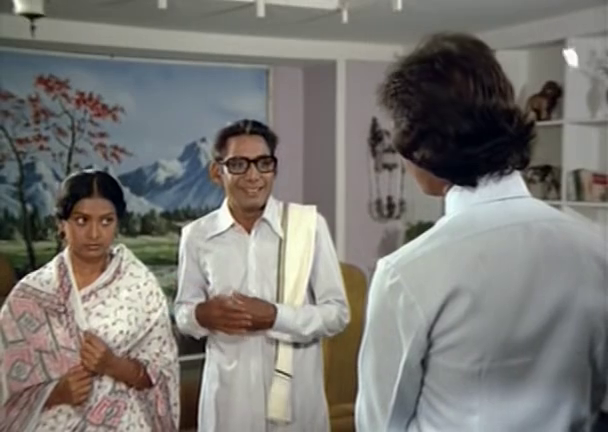 Murthi wants to see her settled, so approaches Rao who agrees to marry Sujatha. All this despite me knowing that Murthi loves her and she loves him. But I had faith it would all be set to rights. It isn’t just the central couple that have their moments. Sujatha’s sister Lakshmi (Tulasi) is an impulsive and extroverted girl. She spots the ultra groovy Murali (‘Subhalekha’ Sudhakar), Adisseshaya’s other son – really, how could you miss him in those trousers? She is smitten and he cannot resist. They are mostly a comedy diversion, but since their antics are actually moving the plot along I quite liked them. 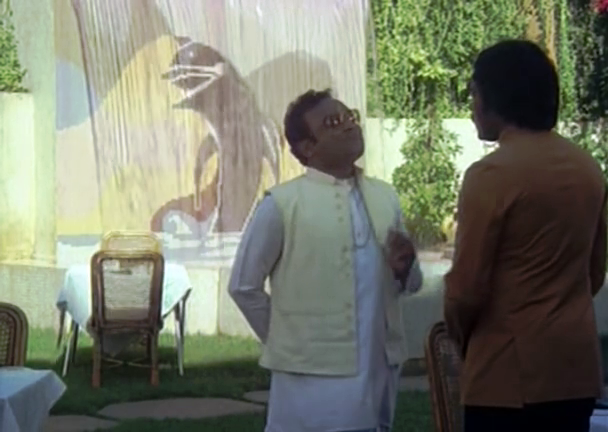 Plus Murali’s dance moves are just hilarious (as is the decor in his room). Even though the sight of him made me giggle, Murali is a strong willed young man and sticks to his guns. Murali and Lakshmi conspire to prove a point and sort their families out, showing surprising sneakiness. I dither between thinking they are perfect for each other and wondering what will happen when disco dies or their hormones settle. But I enjoyed most of their scenes and thought they both had fun with their characters. Mohan –the original groom for Sujatha – also has a surprise for his dad. While everyone was running around like headless chickens, he went and got married to Murthi’s sister. He did what he thought was right, and avoided his father’s veto by not asking for permission. The younger generation in the film are educated and have opportunities, so they are able to challenge outmoded practices. The film is firmly anchored in realism and there is very little glamour or fancy apart from the characters’ own mild daydreams. The houses, workplaces and clothes all seem appropriate and not too new. There are nice interior details, and someone in the hotel had a thing for feature walls. The humour is integrated into the story and characters and there is little pointless comedic shtick. When Murthi returns to his village, he sees a line of people outside his home, and suspects something bad has happened. But they are only lining up for food his grandmother (Nirmalamma) is giving out. The scene unfolds beautifully with tears, overacting, and laughs, showing Murthi at home and his relationship with his family. Rallapalli and Allu Ramalingaiah have smallish roles but provide good foils for Murali and Murthi. I really liked the way the story plays out, and how the different characters all come back into the picture at the end. KV Mahadevan’s music is pleasant. I never wanted to fast forward through the songs but I really can’t recall any individual melodies. This is not a big song and dance type of movie and the music does match the story and mood. I can only assume the lyrics also reflected what was going on. This is such a restrained and well judged film I had to check again that it was indeed the same director that made the far less sensible Aapathbandhavudu! The last few minutes lost me a little as the story was resolved by booming voiceover while the action continued. I would have preferred letting the characters do the talking, but it is a satisfying film. See it for a nicely balanced romance with a social message and of course for the excellent Chiranjeevi. 4 ½ stars! (A small deduction for the dire picture quality which annoyed me greatly). Right from the very opening scene Subhalekha is a mesmerising film and surely only Chiranjeevi could make a small incident with a dog into such an entrancing piece of cinema. The story flows smoothly from one scene to the other and despite my very poor quality VCD copy, the quality of the film editing stands out. It’s very disappointing that Subhalekha isn’t available with subtitles, as although the basic story is relatively easy to follow, I am sure that I missed so much from not understanding the dialogues. There are quite a few long speeches where, although the general idea comes across due to the way the character speaks, it’s very frustrating not to know the details, especially since everything points to the dialogues being well written. Chiranjeevi is excellent as the faithful and kind-hearted Murthi but Sumalatha puts in just as strong a performance. I found her scenes when she defies her prospective father in law gripping, despite the fact that I didn’t understanding a word! As much as I enjoyed the developing relationship between Murthi and Sujatha, the romance between Sujatha’s younger sister Lakshmi and Mohan’s brother Murali was easier to understand and probably for that reason their interactions were some of my favourite moments in the film. 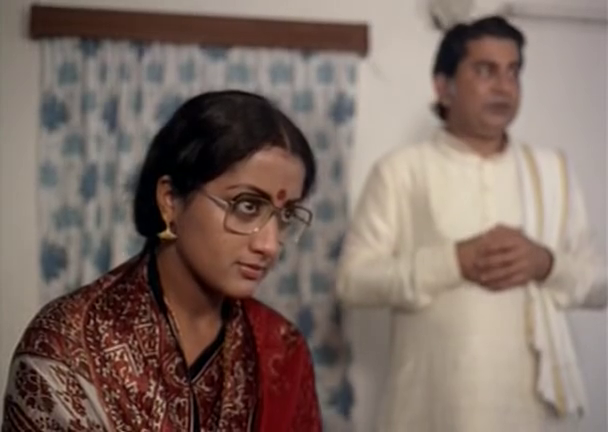 With his snazzy clothes and the huge over-sized glasses, so typical of the times, ‘Subhalekha’ Sudhakar was perfect in his role as the hip and trendy younger brother, and Tulasi was lovely as the rather feisty and adventurous Lakshmi. I also appreciated the quarrels between Murali and his father, and the declarative way Murali ended every argument with “I love her!” made me grin every time. I enjoyed all of the songs in this film, but my favourite was one pictured on Lakshmi and Murali as they cavorted around on the beach. It was only just overshadowed by Chiru’s excellent fridge advertising which was brilliant but not quite long enough for me. Just a little Chiru classical dance is never enough and I wanted more! Films with a social message can often end up with too much preaching and not enough actual story, but that certainly isn’t the case here. The characters all seem to have genuine reasons for acting the way they do, even Adisseshaya is following convention rather than just being difficult and greedy (although of course he is that too), and it is all feels true to life. I do wish though that more discussions in real life could be held in the form of song in the way that Murthi communicates here. This is such an excellent film that I am amazed it hasn’t been restored and re-released with subtitles. Despite the often poor quality of the VCD, Subhalekha is well worth a watch for some great performances and a well told story. Plus of course no-one does shy and bashful as well as Chiru! 4 ½ stars. This entry was posted in Tollywood and tagged Adventures without subtitles, Allu Ramalingaiah, Arun, Chiranjeevi, Chiru, Girish, K. Vishwanath, K.V. Mahadevan, Kaikala Satyanarayana, Nirmalamma, Rallapalli, Subhalekha, Subhalekha Sudhakar, Sumalata, Sumalatha, Telugu, Tollywood, Tulasi. Bookmark the permalink. Yaay! So glad you finally reviewed this one! It’s one of my favourites as well for all the reasons you already mentioned (the fridge commercial, the dog dance, the sister, the singing arguments, the Chriu-ness of it all, etc.). But I will join the chorus in wishing it was available in better quality and with subs. All those long dialogues towards the end may be brilliantly scripted but they’re boring as hell to watch when you’re not understanding what’s being said. Thank God for Chiranjeevi being such an expressive actor, else I would have fast-forwarded through the entire second half. Excellent review for an excellent bit of cinema! Dog voiceover! Do you think there’s a career to be made out of that? Delightful! I’m practising. I don’t know if I’ll be able to lose my accent enough but maybe I could dub for the fancy foreign breed pets? I have been searching your blog for a review of this film as you have mentioned it in other posts too. Glad to read your review. You have followed the movie in totality despite the lack of subs – congratulations! I managed to get a copy from India – it is also a VCD. Agree with the poor quality. I really enjoyed the movie – well paced, good story, good characterisation. In fact this is my first chiranjeevi movie. I actually waited to begin my chiru journey with this movie. In fact I should thank you girls for getting me interested in watching his movies! your enthusiasm and chiru fandom made me think – what have i missed in not seeing a single chiru film? So asked my siblings in India to send me this movie along with other dance/music ones like swarana kamalam (thanks to minai minai), Ananda Bhairavi, Swathi Muthyam, Sagara Sangamam. These are all in my “To Watch” pile. Have only seen subhalekha so far. I found Swarnakamalam via Minai Minai too 🙂 I quite liked it, with some reservations. Sagara Sangamam is excellent, especially for the dancing. Well, I would suggest if you are interested in seeing more Chiru that you might like Aaradhana and Rudraveena (which has a music theme). They are both lovely films and not mass/action.